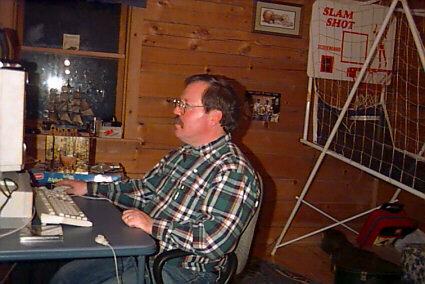 My son snapped this picture as I was formatting the images using the Compaq Prolinea 5100e PC in his room. Our 2 PCs are networked together and I was using Corel PhotoHouse on the Compaq to try to clean up the images that were stored on the other PC. I used a Kodak digital camera that I borrowed from work. The camera will only focus at a distance greater than 4 feet and the photos were taken at about 2 1/2 feet, so they're a little blurry. I'll try to improve the images as the site grows. The photo below is one of the blurry images I took. 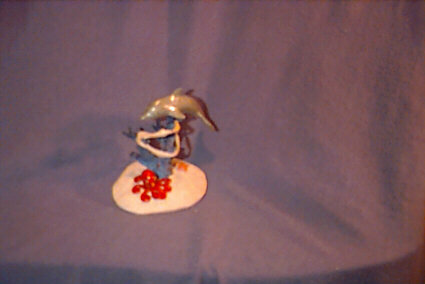 It is a dolphin swimming over the top of a set of shark jaws. Big Shark!! Actually, the jaws are real. They came from a shark that my son caught while we were visiting Claylaydee in Savannah. Her husband cleaned the jaws using some little known Native American method. He could tell you how, but then you would have to be silenced using some other secret method. If he told you about that secret method, then you would have to be silenced using... you get the drift. Anyway, I wish I had the equipment necessary to get really sharp images of the shark's teeth. (Sorry, I couldn't resist!) I really do hope that eventually we will be able to provide better images that will reflect Ginny's talent.